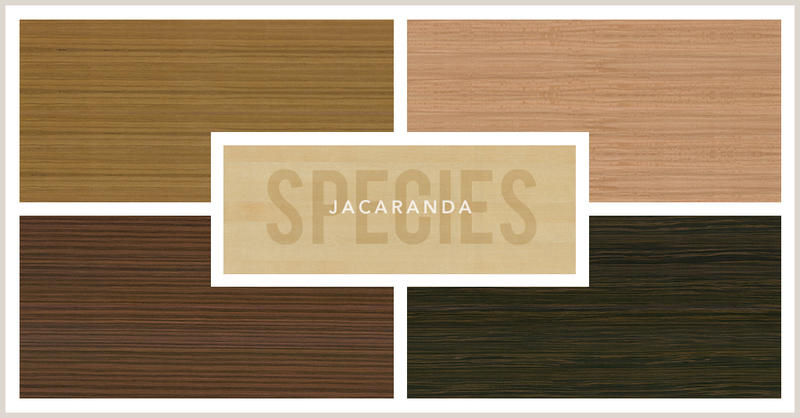 We offer a variety of wood species - Jacaranda, Inc.
Jacaranda, Inc., offers an extensive selection of wood and wood-based architectural materials in many species, cuts and configurations. For more than three decades, we have been perfecting the art of sustainably harvesting wood to create environmentally friendly wood veneer products that are both beautiful and durable. The result is SanFoot, a versatile, stunning veneer that can be used for any commercial wall coverings, millwork and specialty applications. When looking through images of the various species, you might notice additional letters behind the name of the wood. These refer to the way the wood has been cut. “FC” refers to a flat cut, or a cut parallel to the log’s pith. “QC” refers to a quarter cut, or wood that is cut along the edge for a ribbon-like appearance. “RC” refers to rotary cut, which is made when the log is centered in a lathe and rotated against a stationary broad cutting knife. “Burl” refers to distortions or abnormalities in the grain of the wood. Burls can be subtle or vivid in color and can have dramatic patterns. They are not made by the cut of the wood but occur naturally when a tree has been stressed by disease or injury and healed. A burl cannot be made or forced, but their incomparable beauty makes them highly prized by both architects and designers. “Recon” refers to reconstituted wood fibers. Our recon wood veneer products enable us to reproduce virtually any rare and exotic species without negatively affecting the environment. Recon woods use wood from well-managed plantation grown forests, replacing older trees with younger trees that more effectively use carbon, to recreate the look of prized and expensive woods. We can use recon woods to recreate exotic, rare and expensive woods that would otherwise be unattainable. Each species and type of wood that we offer is available in a wide range of colors, grain patterns, stains and finishes. When you specify wood veneer, you can create virtually any look to match or complement your color scheme or decor. Our scientists can use digital printing, dyes and inlays to further add to the beauty and limitless options, and Custom Elite finishes and stains are available, too. We even have incredibly thin translucent veneers for one-of-a-kind lighting options. SanFoot is pre-finished using clear urethane. Two layers of this clear coat offer protection with a satin finish. You can increase the sheen to 30 percent for a semi-gloss, which enhances the wood’s natural beauty for an eye-catching wall or centerpiece. A 70-percent sheen offers a glossy, mirror-like shine. Architects and designers can use it just like a vinyl wallcovering to create a luxe feel and brilliant look to any environment. Check out our website today, and remember to specify wood veneer when you choose the new look for your commercial project.